Although this is the prequel to “Every Heart a Doorway,” it will actually spoil that story if you read this one first. See related articles on Tor.com. 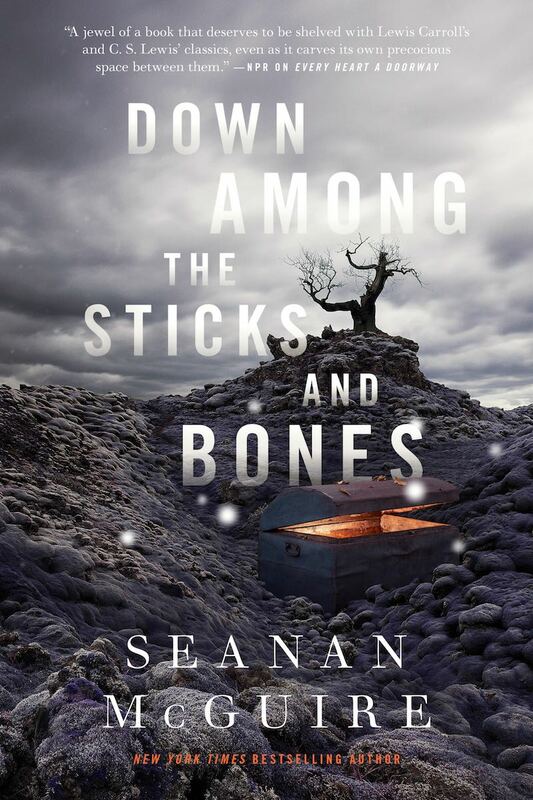 "Down Among the Sticks and Bones," by Seanan McGuire [bio] (edited by Lee Harris), published on June 20, 2017 by Tor.com. Pro: If you did read “Every Heart a Doorway,” it completely fleshes out Jack and Jill’s story. Everyone has a different agenda in this tale. Jack wants to play and get dirty and to learn things. Jill wants to be a lady and be admired. The Master wants a “daughter.” Dr. Bleak wants an apprentice. But the overarching plot is that this is the story of how Jack came to love her sister and got her back from the clutches of evil. The first section establishes how their parents created two rather damaged children, but Jill was definitely the more damaged of the two owing to her isolation as she continued to be a tomboy even as she got older. It’s not a surprise that she was drawn to someone promising to love her and take care of her and make her beautiful. By contrast, Jack was bored and unchallenged. Used to be admired, it’s not surprising that she viewed the Master’s attentions suspiciously nor that she was drawn by an offer to learn about science and nature. Even during their period of separation, there are plenty of clues that there’s still a bond between them. Both nourish hopes of getting their sister to join them someday. Jack’s love for Alexis comes across as sweet and innocent—it feels very real. It’s fitting, if horrible, that Alexis ends up being the sacrifice Jack must make to be reunited with Jill. This is even foreshadowed in the scene where the ribbon maker tells Jack that his jealous sister will kill anyone who gets close to her. The climax involves plenty of tension, even though (having read “Every Heart a Doorway”), we know how it comes out. The author makes the unusual choice to use a third-person omniscient narrator, and it works to great effect. The chatty, opinionated narrator adds a good bit of necessary comic relief to an otherwise-grim story. Con: The parents are cardboard villains—a caricature of unreasonable, overbearing parents. It is hard to like Jill much, no matter what allowances one makes for her treatment by her folks. One continuity problem is that Dr. Bleak sent Jack to recover Alexis’s heart. What happened to it? Another problem is that it’s impossible to believe that Jack was able to extricate Jill from the mob merely by surprising them. Most likely, they'd have burned them both. I actually liked this one better than the first, and I really liked that one! No question that they were both really good.